DETERRENCE = Unidentified Armed Defenders, In Unknown Locations. Concealed carry of firearms by school staff – or church cadres, or businesses, or even just broadening the right to legal concealed carry by civilians – provides the ability to defend innocent lives in the first seconds that they come under attack, when police are minutes away at best. While some in our society have difficulty grasping that simple concept, even more push back against the assertion that this capability actually deters attack, and that the deterrence is far more powerful when it is in fact concealed carry by unidentified persons, whose presence, location, numbers, and response cannot be predicted by a would-be offender. Some people understand this concept implicitly, while others do not. We are asked, “Where’s your data?” We point to the absence of mass shootings where people are known or likely to be armed, and especially to public schools in districts across 24 states that allow concealed carry by non-law enforcement (under a variety of conditions and requirements, but the skeptics ask, “How can you prove that the absence of shootings there has anything to do with concealed carry by permittees in their schools?” Well, here’s the answer: there’s no definitive data. There’s no proof. This is not something that can be established statistically. It requires critical thinking, common sense, and some experience-based understanding of how humans think, plan, and act in the arena of violence. In 2015, U.S. Army Lieutenant Colonel Craig Broyles submitted his Master’s thesis at the Command and General Staff College, Fort Leavenworth, Kansas. Titled Military Maneuver Terrorism, it addresses the threat against the U.S. and the West of terrorist attacks involving multiple attackers using small arms, explosives, and other low tech, like those that occurred in Mumbai, India (2008), at the Westgate Mall in Nairobi, Kenya (2011), and at the Beslan school in the Russian republic of North Ossetia (2004). He cites, among many other sources, a piece that I wrote as a research paper at the Naval War College in 2007 and published in Homeland Security Affairs in 2008: Paramilitary Terrorism – A Neglected Threat, which made several of the same points. We both applied similar concepts that are familiar to people schooled in risk management, threat assessment, intelligence, and the operational and strategic arts. LTC Broyles recommends several potential remedies to this threat but points out that deterrence is the most important strategy against the threat of a large, organized armed group of terrorists attempting a mass casualty attack. If such an attack is executed, regardless of how well we respond, the consequences will be terrible. Better to keep it from happening at all. One thing that terrorist organizations have in common with most of the apolitical psychopaths who perpetrate mass shootings is a penchant for planning, and especially a desire for their action to go off according to plan, without a hitch. They study their target, and if they don’t select a target because it is undefended, they have carefully prepared plans on how to circumvent or defeat whatever defensive element is there. Unpredictability is their worst enemy. They have one shot at it, either because it’s an individual who plans to die on site when he is done, or an organization that risks irreplaceable resources by coming out of the shadows to execute an attack. The presence of an unknown number of unidentified armed defenders, in unknown locations, with response plans and specific training and rehearsals that the attacker cannot find out, is precisely the kind of thing that discourages or deters them from ever acting. “Beginnings are delicate times” as some sage said, and the chance of having your grand one-off final curtain event come apart in its first minutes, because of stout resistance you were unable to predict, is literally a show-stopper. LTC Broyles points out the obvious – that, because of the unpredictability it creates, concealed carry of firearms by American citizens, everywhere they can (and therefore presumably do) carry, deters terrorists and other bad actors. The jihadist killing spree on the streets of Paris in November, 2015 has not occurred on the streets of any American city, and I can think of one primary reason why. We should be working to extend the distributed security provided by discreetly armed citizens into more locales, rather than fewer. Arm school staff, arm church security teams, arm business associates in the workplace. The police cannot be in these places to protect us – though we welcome and rely on their assistance – but we can. Bill Tallen is Executive Vice President – Tactical Operations of Distributed Security, Inc. Prior to joining the enterprise he had a 20 year career with the Department of Energy, where he served as a Federal Agent, team leader, unit commander, training instructor, and manager in the agency which provides secure transportation of nuclear weapons and nuclear materials within CONUS. He helped to found DOE’s Special Response Force program, developing and teaching urban and close quarter battle techniques to Federal Agents charged with recovery of lost assets. He has designed and conducted a variety of wargaming efforts in support of vulnerability assessments, security system design, and leadership training, and has taught a variety of crisis decision making models. Bill holds the degree of Master of Arts in National Security and Strategic Studies from the U.S. Naval War College. 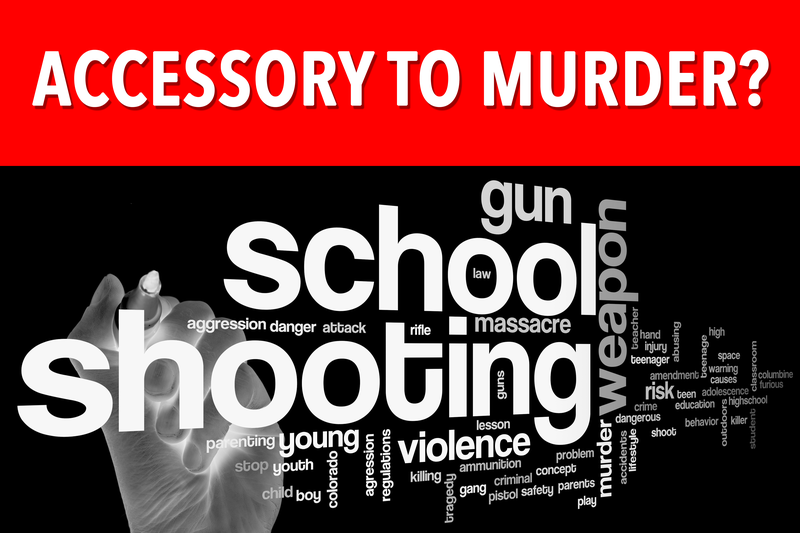 School Shootings: Are You An Accessory To Murder? Facts continue to emerge in the aftermath of the mass shooting at a Broward County, Florida high school. But already, they are drowned out by the ill-informed, emotional calls for more restrictions on gun ownership. We won’t enter that endless debate here. Instead, let’s cook down to the essentials of what we know about this incident. We will not name the shooter, because infamy is what they want. He was identified as a threat. His public social media accounts demonstrated the threats. He was expelled from school because he was threat. The Police visited him because they knew he was a threat. The FBI was aware of him because he was a threat. The students were aware of him. All the so-called warning signs were missed. Nothing was done, and we have to ask, once the wave of sentiment has passed, what could have been done. There may be some fixes there, but behind all of this is our bedrock principle of the presumption of innocence, and the question: had he committed a crime or provided probable cause to believe that he was about to do so? Reports and suspicions in this case turned out to be justified, but do we want a society where anyone can be “taken off the street” on the basis of another citizen’s “suspicion”? Do we want to return to the days of forcible commitment to mental health facilities without due process of law? Perhaps we do; but be careful what you ask for. He bought the weapon legally, because we allow 18-year olds to buy rifles, and there was nothing in the background check database that flagged him as ineligible. But do we really believe that he could not have found a gun on the secondary market to buy for cash, if he had been turned away by a licensed dealer? The students had drilled active shooter scenarios. But even if we believe that “lockdown” would have stymied a rifleman who simply walked onto the school campus, as riflemen will do (see Sandy Hook), one pull on a fire alarm sent targets flooding into his field of fire. “Active shooter scenarios” – and planning – need some work. There were uniformed cops stationed on campus. This is another palliative measure that contributes some undefinable level of security – or at least the reassuring, uniformed appearance of it – to a school. But from Columbine to Broward County, we have seen uniformed officers on scene unable to engage and reduce the body count. And 17 died – unnecessarily. The missing ingredient? Armed and trained school staff members on-site. We are not talking about more law enforcement officers, or random armed civilians, or – certainly not! – armed high school students. We are talking about volunteer members of school staff – with a direct stake in their own safety, their peers’, and their students – discreetly carrying concealed handguns, and trained to respond immediately in the first seconds of an incident. With an enrollment of 3,000+ this school should have had ten to twenty of them, spread across the campus attending to their everyday duties, their identities and locations unknown and unpredictable to any potential attacker. Because the only way to deal with a decentralized threat is with distributed security. Rather than wailing “this has to stop,” accept the fact that it will not stop, and take action to defend your yourself and your community. You’re never going to confiscate guns in the US. Criminals will not obey your laws or signs. Cops won’t be there when the shooting starts. 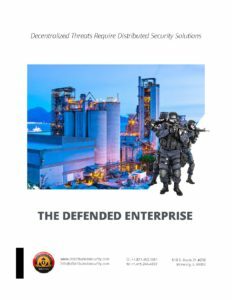 The only option is train to defend – decentralized threats require distributed security. Anything less than that is tantamount to being an accessory to murder. On November 29, 2017, Newsweek magazine reported that ISIS is now urging their “lone wolf” terrorists to attack American children. There is nothing new about Islamic terrorists targeting children and schools; they’ve been doing it for decades globally, and the death toll is in the thousands. They haven’t done it yet in America, but it will be a miracle if that day does not come. Signs of their intent and preparations have been discovered for years – reconnaissance of school buses, training videos captured from Al Qaeda, school floor plans in the files of the San Bernardino jihadist couple, and more. The threat is certainly very real. 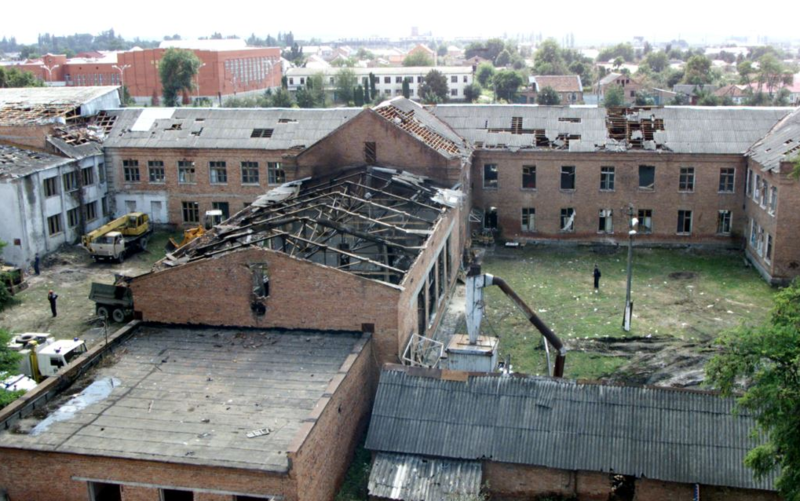 We haven’t seen anything, in a America, like the 2004 attack by Chechen Islamic extremists on Beslan School #1 in the Russian republic of North Ossetia, where 330 people – students, parents, staff, and ten responding soldiers – were killed and 728 injured, by a band of 50-70 terrorists, many of whom escaped in the chaos of the final, emergency assault by authorities. 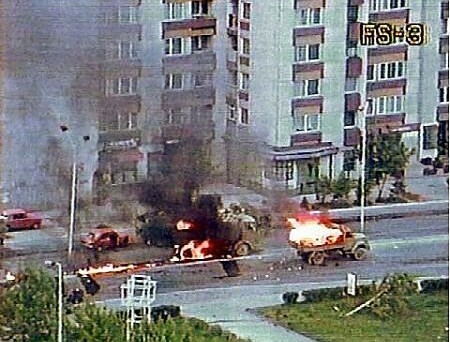 This is a worst case scenario, an improbable event in America, because of the enormous difficulties involved in planning, organizing, equipping, and staging actions by armed groups of this size here without being detected and compromised. The trend of jihadist terror attacks in every Western country for the last several years has been quite different: decentralized actions, committed by individuals or small groups with minimal outside direction or support. That is exactly what ISIS is now encouraging, targeted specifically on our children. If community engagement, proactive policing, and the constant background efforts of the intelligence community allow even a handful of radicalized individuals to avoid detection before they execute the sort of action now openly urged by ISIS, we must be prepared to disrupt and defeat their attack in its earliest moments, whether it is targeted on schools, other institutions, public gatherings or any other venue. Are Southeast Michigan schools at risk? Michigan has a thriving Muslim population, more than two and half times their proportion in the U.S. population overall. Our purpose here is not to impugn the members of this community, who are overwhelmingly peaceable, law-abiding people. 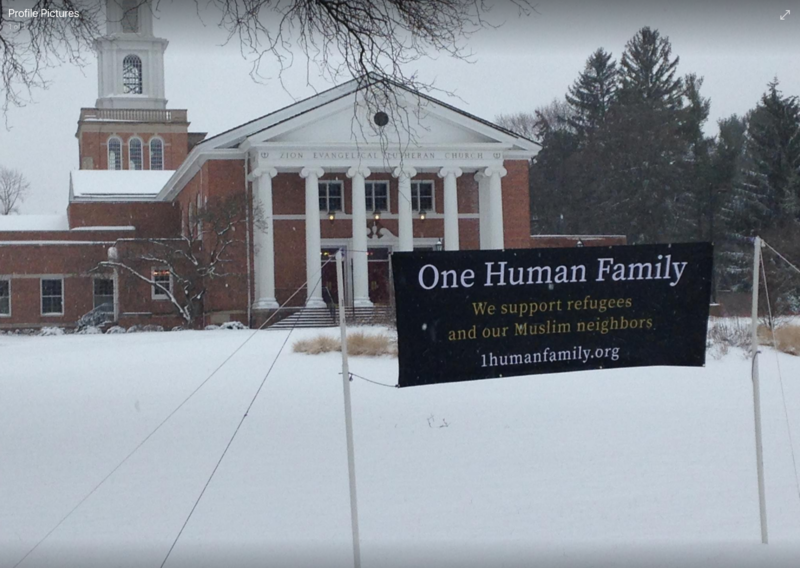 However, as Dearborn’s Chief of Police Ron Haddad has acknowledged, individual Muslims in this community, as elsewhere, may be susceptible to the propagandizing, indoctrination, and incitement to violence of groups like ISIS. Chief Haddad’s relationship with the local Muslim community is the first line of defense against this threat. 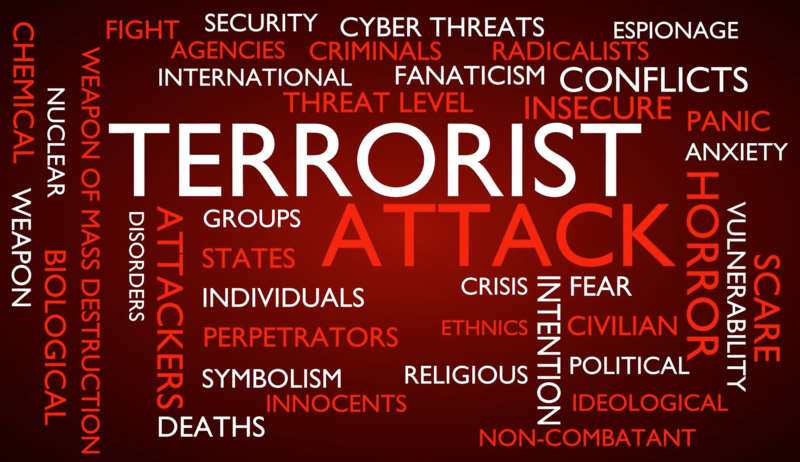 However, the huge potential consequences of any failure to detect radicalization within the Muslim community suggest that more may be needed to ensure our safety. Dearborn to Ann Arbor 30 miles as the crow flies. Southeastern Michigan has many schools that represent soft targets attractive to a lone wolf terrorist. Of these targets, Ann Arbor, only 30 miles as the crow flies from Dearborn stands out as an especially vulnerable community due to its “progressive” view on gun control and its vocal school board adamantly refusing to allow trained individuals to carry weapons inside schools. This vulnerability is further compounded by many Ann Arbor residents who feel that One Human Family yard signs combined with Gun Free Zone stickers on school windows will act as magical talismans in thwarting a potential attack. Are Southeast Michigan schools vulnerable to a lone wolf attack? Yes. How do we defend against a lone wolf attack on our school children? There are those whose fear and antipathy toward firearms lead them to believe that palliative measures like the ALICE program will provide real security against armed attack. ALICE encourages the belief that upgrades to physical security, and to procedures and protocols for lockdown or evacuation, or last-ditch resistance via flying tackles and thrown staplers will defeat a determined active shooter. While physical security measures are important and useful, they are unlikely in themselves to delay an active shooter for the 5-10 minutes or more before police arrive and intervene. Students of military science understand the axiom that obstacles not covered by observation and fire provide nothing but delay. All obstacles can be defeated. Sandy Hook Elementary School had a locked front entrance – but the attacker shot out the adjacent glass, reached through and opened the door. Locks on internal doors can be defeated; doors and walls themselves can often be penetrated by gunfire. Unarmed resistance to a determined shooter is a desperation measure, unlikely to succeed – the one heroic individual who tried it at Virginia Tech was simply shot to the floor at the attacker’s feet. Programs like ALICE, and the measures they promote, are better than simply denying the possibility of armed violence in the school, but not by much. When good intentions are not enough. We suspect that most parents and staff at Sandy Hook, Columbine, Jonesboro, Virginia Tech and the rest believed “it could never happen here” until the day it did. The threat, which in any one location may have a very low probability of occurrence, has the highest imaginable consequence, and deserves more serious and realistic attention, before that day. Michigan’s current gun laws, like those of many other states, aren’t helping as they present an irrational mix of restrictions and permissions for both concealed and open carry by citizens. Under current law, open carry on school property is broadly permitted, while concealed carry by permit holders is prohibited, exactly the inverse of any reasonable approach. Open carry alarms many people, especially when it’s open carry by anyone, on school grounds. Concerns about the psychological effect of visibly armed people – especially strangers unknown to students and staff – are not overstated. Rightly or wrongly, it distresses the innocent. Even from a purely tactical perspective, we don’t promote open carry; to the bad guy, it just hangs a “Shoot me first” sign around the citizen’s neck. As professional firearms trainers, we do not support open carry on school property. There’s a huge difference between open and concealed carry, and it does no service to anyone to conflate the two. Most of us pass fellow citizens legally carrying concealed weapons on a daily basis, without identifying them or being affected one way or the other, because the weapons are hidden, and are not presented or used except in the defense of the innocent; this occurs rarely, but when it does it is far preferable to the alternative. Responsible concealed carry in the schools would be no more obvious than it is on the street. The Michigan House is now considering Senate Bill 0584, which would extend legal concealed carry by holders of Concealed Pistol Licenses who meet additional training requirements, to several venues where such carry is now forbidden, including schools. Several other states have had similar laws on the books for years, and there is no evidence of a decrease in real or perceived safety and security in their schools. The battle lines over expanding concealed carry are drawn largely on ideological grounds – people generally hostile to private gun ownership and carry oppose the legislation on principle, while those who believe that more guns mean less crime think this legislation would make everyone safer. The historical record supports the latter group. There are those whose fear and antipathy toward firearms lead them to believe that palliative measures like the ALICE program will provide real security against armed attack. Holders of concealed carry permits nationwide are demonstrably more law-abiding than the general population and even than law enforcement officers. They almost never commit any form of violent offense, and almost never have their permits revoked for cause. Predictions of Wild West shootouts and blood running in the streets, which accompanied the liberalization of permitting laws over the last three decades, have proven false. In states with “shall-issue” permitting systems – where law enforcement authorities cannot restrict permits to people who show direct and immediate cause – violent crime has been trending downward for years, a trend masked by its continued uptick in a relative handful of major urban areas, many of which, paradoxically, severely restrict firearms possession and carry by the law-abiding. There is yet another option that the legislature might consider, that has been proven successful elsewhere. At least 12 states allow concealed carry in schools only by school district employees, and only if they both have a valid state concealed carry permit, and are individually approved for carry by their local school board. This neatly answers the oft-stated concerns about “strangers” of unknown intent carrying weapons on school property, and is a great example of the principle of government at the lowest possible level. 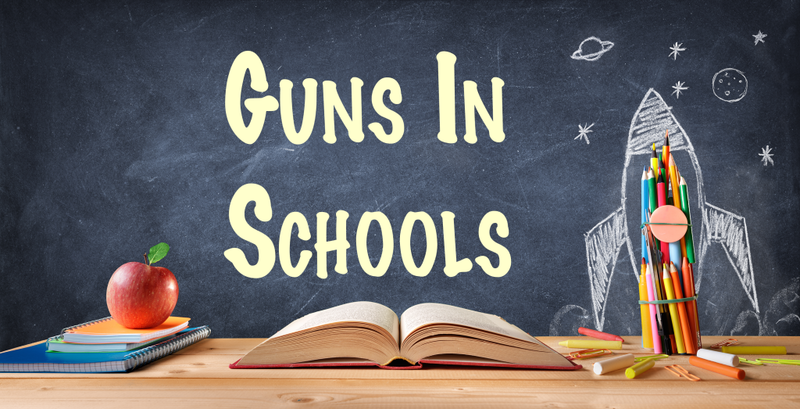 School boards can choose not to implement these laws, authorizing no concealed carry by their staff; but when neighboring districts do so, without negative consequences, attitudes tend to change. Shifting our focus from the political to the practical and tactical, professionals in law enforcement and counterterrorism recognize a critical fact: that most mass shootings (variously defined as 3-5 or more victims in one incident) are over within 5-10 minutes of their start, ending when the shooter decides he’s done, well before police are able to respond and intervene. At an average rate of 6-8 more casualties every minute, the casualty count climbs very swiftly during the critical gap when seconds count, but police are minutes away. The only practical solution is to have armed individuals – the NRA’s “good guys with guns,” or what we eponymously call “Distributed Security” – on scene and able to respond swiftly. Fears of over-reaction, indiscipline, or poor marksmanship resulting in more deaths and injuries have no foundation in fact. Historically, citizens legally carrying firearms tend to be judicious, restrained, and effective in their reaction to violence; and what could be worse, in any case, than to let a deranged criminal mind, or a committed jihadist, continue his massacre unimpeded? While Senate Bill 0584 addresses many venues other than schools, in light of the latest ISIS threat against our children, we must focus on school shootings as a horrible subset of mass shootings in general. 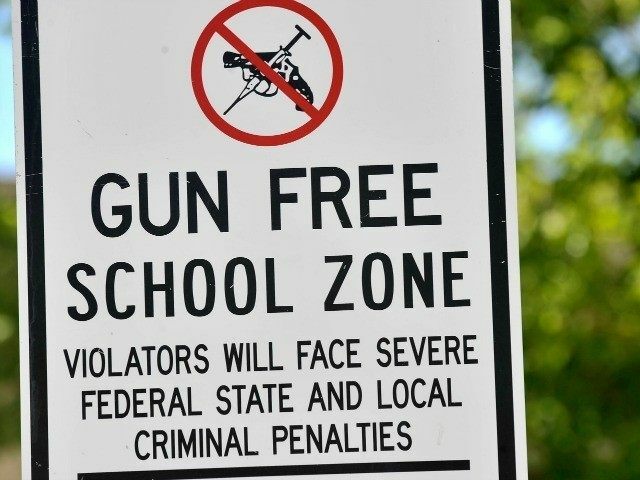 In the past, most school shootings have been the work of one or two mentally disturbed individuals, who target schools that are legally “gun free zones,” because however disturbed they may be, these people are not generally stupid. 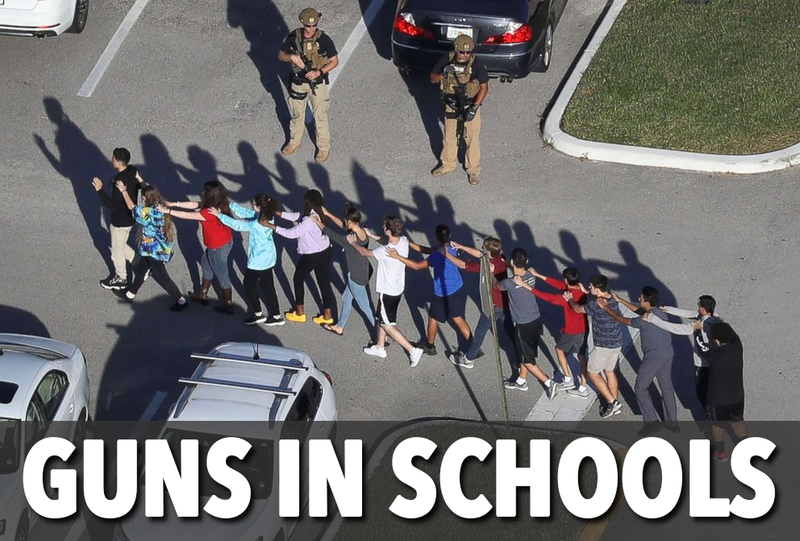 Schools are largely unprotected, and the perpetrators usually plan their attacks carefully, and study those who have preceded them, to learn from their successes and failures, and to try to eclipse them with higher body counts and more lasting fame for themselves. As bad as this is, the past may not be prologue. Whether in planned, coordinated actions like those foretold in William R. Forstchen’s cautionary 2014 novella Dies Irae: Day of Wrath or in “lone wolf” attacks by one or a handful of self-organized jihadists, this threat to our schools is real, and may be considerably more serious than that posed by the unpredictable actions of mentally and emotionally disturbed individuals, because terrorists engage in even more careful and deliberate planning and preparation. Counterterrorism depends upon a strategic continuum of goals: we seek first and foremost to deter or detect the enemy in his planning and preparation phases; convincing him, before he ever initiates his attack, that his chances of success do not justify the risk the effort entails. We’ve been fairly successful in this, in America these last 30 years. Every success we achieve (and they are seldom publicized) serves to discourage other potential attackers from trying, making their efforts more and more expensive, risky, and complicated. However, there will always be ‘leakers’ – those not detected or deterred. We have to be ready to defend ourselves – and there is no potential target more important to us than our children, as ISIS clearly understands. Of course we are not concerned only about the children, as every gathering, from marathons to sports events to concerts and art fairs, of free citizens in a free society presents an array of attractive targets. Some venues and events are more easily guarded than others; some cannot rely on police presence, overwatch, or swift response. Among the many cautionary examples to consider is the jihadist rampage in Paris in November, 2015. How different the outcome might have been if even a few citizens on the streets or in the clubs had been legally, discreetly armed and able to resist rather than flee or hide under tables. Well trained staff is part of the answer. When detection and deterrence fail – as they must inevitably, eventually – those who attack our civil society could be disrupted or defeated in the first moments of their effort with the same cool heads and trained skills that are commonplace among armed citizens today. But the defenders have to be there, on site, ready to act; the law must not discourage them, as they are overwhelmingly law-abiding citizens. The mere presence – presumed or actual – of armed defenders serves to discourage attack. Not to make light, but the cliché about criminals not holding up cop bars and gun shops has, like most clichés, a kernel of truth at its core. 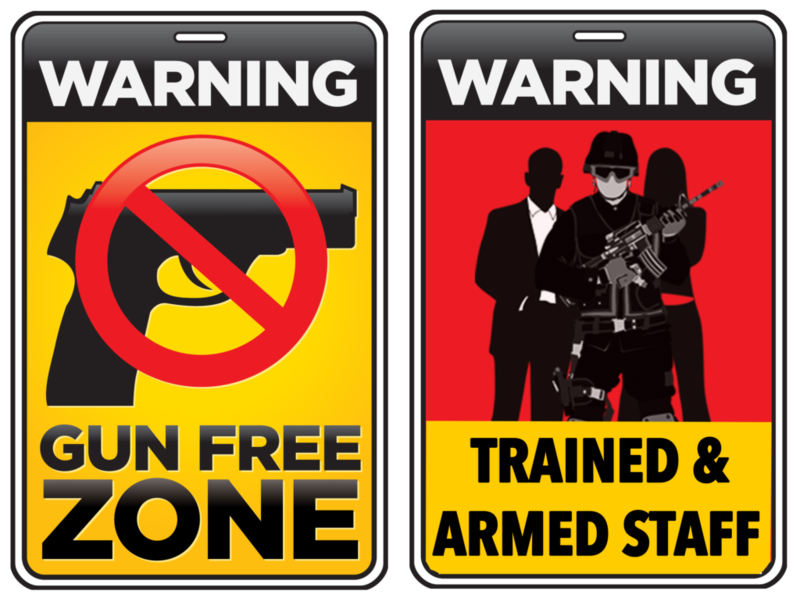 Deterrence is the first, and maybe the most important result of replacing “Gun Free Zone” signs with an assumption that any adult on scene might be armed and prepared to resist. 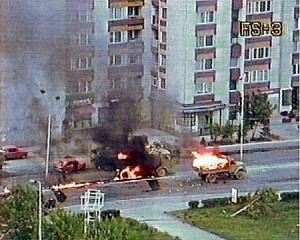 Such locations are very seldom struck with criminal or terrorist violence. Sun Tzu wrote, thousands of years ago, that to win before the battle opens is best; but he also said, “In death ground, fight.” We must be prepared to fight, or who have we become as a people, a civilization? The answer to distributed threats is distributed security. Support well-crafted legislation that closes the real “loopholes” in public safety, the prohibition on armed defense of self and others in many attractive target areas. 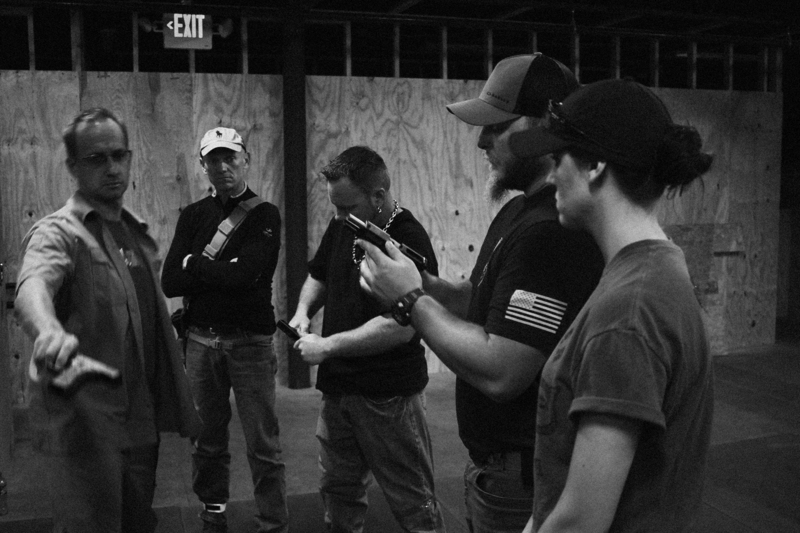 Arm yourself, train, and where appropriate, work with others to make the most valuable targets the hardest targets. Bill Tallen is Executive Vice President – Tactical Operations for Distributed Security, Inc. Prior to joining the enterprise he had a 20 year career with the Department of Energy, where he served as a Federal Agent, team leader, unit commander, training instructor, and manager in the agency which provides secure transportation of nuclear weapons and nuclear materials within CONUS. He helped to found DOE’s Special Response Force program, developing and teaching urban and close quarter battle techniques to Federal Agents charged with recovery of lost assets. He has designed and conducted a variety of wargaming efforts in support of vulnerability assessments, security system design, and leadership training, and has taught a variety of crisis decision making models. Bill holds the degree of Master of Arts in National Security and Strategic Studies from the U.S. Naval War College. In the previous article I mentioned “target indicators” and now that we have laid the foundations for some tactical principles which will help you out in your ongoing quest to refine your tactics and techniques, let’s start with a deeper discussion about target indicators and how the above principles can be affected by the situation, as well as the type of information we are talking about gathering. Target indicators are anything your adversary does to give you any actionable information of their whereabouts, intentions, and/or actions. In short, target indicators give you the ability to begin your decision making process by observing. At the same time, keeping the principle of duality in mind, target indicators would be anything you do that can give your adversary information that you would rather deny him. Generally speaking, it is best that you remain unobserved until you choose to reveal yourself and when you do reveal yourself, it should be for the shortest time possible and only to the extent required to affect the change you are attempting to cause. We observe target indicators via our five senses, and while sometimes you may get all the information you need from one piece of information or one of your senses, many times especially when dealing with close and personal protection it may take several pieces of information fed through multiple senses which will give you a fuller picture of what you are dealing with. Below, I am ordering the senses according to the amount of process capability of each has compared to the others, or how much information we can gather from each sense in the same amount of time relative to one another (assuming that all senses are working well with no impairments). If you have read the previous articles you should be coming to grips with the fact that there are neither guarantees in a fight for life, nor are there any wrote patterns or solutions that you should be looking for in your tactics. Additionally, theoretical concepts and excellent technique without intellect, speed, and certainty of action will cause your tactics to be formalistic, rigid, slow, predictable, and easy to overcome by your adversary. 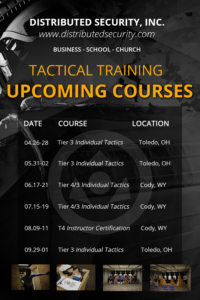 While there are no patterns, there are basic individual tactical principles that you need to become familiar with that you should strive to understand and which you should also make a part of your trained response. That is to say that you need to understand and practice the techniques sufficiently enough that they become a part of your trained response – actions and things that you do without your having to consciously think about them [Unconsciously Competent or “U.C.”]. The principles which we are about to lay before you set the educational groundwork for your training and give you reference from which you can start to build and modifying your own particular tactical techniques. 1. The principle of scrutiny: Think of this principle as the holistic color code of mental awareness. Using the principle of scrutiny, you will be utilizing all of your senses to observe your surroundings. Tactics: “Tactics can be thought of as an art and science of winning confrontations (verbal, physical, and lethal) by the use of power (mental and physical), maneuver, the integration of different weapons (verbal skills, hand to hand, contact weapons and firearms), and the immediate exploitation of success to defeat your adversary.” William S. Lind, The Maneuver Warfare Handbook, parenthesis ours. Tactics is the product of both art and science. See the beginning of this manual for a more in-depth discussion of what tactics is. Target I.D. : The act of identifying, assessing, and prioritizing potential threats for engagement and/or elimination dependent on the threat that represents the greatest danger to you or other innocents at the moment, and then eliminating your adversaries accordingly. The criteria for target I.D.ing will include many factors, but primarily distance, shock, what type of weapons the adversary possesses, and your adversaries current actions. For instance, a man with a shotgun at 15-yards who is about to shoot you is probably a greater immediate threat than his partner who is now running at you with a knife from a distance of 10-yards. Conversely, if a man with a shotgun was in the middle of a reload, and his partner were running towards you with a knife from 10-yards, you may want to consider dealing with a knife wielding individual first. Maneuver Theory: Maneuver theory is a military concept of conflict that advocates attempting to defeat an adversary by incapacitating their decision making process (OODA loop) through shock and disruption brought about by intelligent, purposeful, and timely maneuver. Personal Security Bubble or “PSB”: Is an imaginary and adaptive sphere of space that exists around the fighter which he is intent on securing whenever and to whatever extent practical in order to maximize his situational awareness and thus, his security. Begin visualizing your personal PSB by first imagining yourself in the center of a circle that has about a seven-yard radius (about one and a half car lengths). You want to be cognizant of and to the maximum extent possible, control the space in this imaginary circle. This also mean being cognizant of three-dimensional space; looking vertically, up and down like in a stairwell, or up to the roof or balcony so now our imaginary two-dimensional “circle” becomes a three-dimensional “bubble” or sphere. In a vast majority of circumstances, when there is no threat, people can traverse your PSB without any concern on your part. Next, imagine a mark at the 12:00 position (straight ahead) and the 4:00 and 8:00 positions (over your shoulders) on your circle as well. Below you will find an index of commonly used definitions. As we mentioned previously, you shouldn’t feel pressured to memorize them immediately; rather, come back to them often when you come across an unfamiliar term while you are reading through this manual. Generally speaking, there are three elements that must be present to justify lethal force are Ability, Opportunity, and Jeopardy. In some states, you must clearly be able to prove that there was little or no reassemble hope of a safe escape or retreat, or by doing so you would have jeopardized the lives and safety of others. Ability – Your adversary must clearly demonstrate that he has the ability to kill or cause serious bodily injury, whether that be through the use of weapons, disparity of numbers, size or demonstrated skills such as martial arts (which you must be aware of beforehand). That is, if your adversary was armed, and not showing that he was armed (concealed carry), or was a black belt in some killer martial art form, you cannot learn of this fact after the fight and use that as part of your defense in a court of law. Opportunity – Your adversary must clearly have the opportunity to kill or cause serious bodily injury immediately.That is, he must be within range without intervening objects or circumstances, which would prevent him from carrying out an immediate attack whereby he could kill or cause serious bodily injury.